What Would You Do For Your Right To Vote? In 1917, they were arrested, dragged to court, then thrown into prison, most at the notorious Occoquan Workhouse. There they were beaten, forced to work, slept in rat-infested cells on bug-ridden mattresses, and fed food crawling with maggots. Their crime? Silently picketing the White House for the right to vote! When word leaked out about this inhumane treatment, it became the turning point in winning the right to vote. Officially, the suffrage movement in the United States began with the Seneca Falls, NY, Convention in 1848 convened by Elizabeth Cady Stanton, Lucretia Mott, and others. It resulted in a “Declaration of Sentiments” based on the Declaration of Independence. In it were listed the many inequities women suffered under the legal and political systems: no voice in the laws, no independent rights after marriage, no custody of children in case of divorce, no right to a college education, no opportunity to enter most professions and no right to vote. Many in attendance did not support women’s right to vote, but social reformer Frederick Douglas eloquently persuaded for its inclusion. The convention framed a national discussion about women’s rights in America and marked the beginning of a massive civil rights movement that would spawn numerous women’s rights organizations and span the next seven decades. The right to vote was seen as the first step to change the traditional and unjust systems that existed against women. Susan B. Anthony entered the movement in 1852 when she joined forces with Stanton. The two suffragist organizations that played a role in the final stages of the movement were the National American Woman Suffrage Association (NAWSA) then led by Carrie Chapman Catt and the National Woman’s Party (NWP) led by Alice Paul. Paul had been part of NAWSA’s Congressional Committee in Washington, DC. Not content with some of the demands placed on the committee, she eventually formed the NWP. NAWSA was considered moderate in its views and actions while Paul and the NWP were viewed as militant. NAWSA originally sought voting rights for women through a state-by-state approach, but eventually Catt’s “Winning Plan” included a federal amendment. NWP solely fought for an amendment to the Constitution. Social change demands both reform methods for success and while the methodologies were divergent, both were necessary to ultimately win the vote. It took thousands of women holding suffrage meetings in their homes, crossing the country to rally the cause and speaking to often hostile crowds to draw attention to the movement. These advocates for liberty, following in the footsteps of Elizabeth Cady Stanton and Susan B. Anthony, held the first national march for a cause in Washington, DC, in March 1913. This parade was pivotal to the movement and also historic for 22 collegiate women at Howard University who founded Delta Sigma Theta Sorority, Inc. They chose to participate in the march as their first public action. The parade was also notable because it was led by Inez Milholland Boissevain on a magnificent white steed. She became an icon of the movement and a martyr to the cause. It’s a question Alice Paul and three hundred NWP members asked President Woodrow Wilson just days after Inez’s moving memorial service on Christmas Day in the Capitol’s Statuary Hall. Wilson remained unmoved and did nothing. One week later, the NWP led the first ever protests in front of the White House. Each peaceful action was greeted with derision and violence. By 1917 women from every state took turns standing at the gates of the White House from dawn to dusk. For months on end. In rain, sleet, and snow. Silent but resolved. In their hands, handmade banners. They were the Silent Sentinels, or “Iron- Jawed Angels” led by Alice Paul on behalf of thousands of volunteers and 20 million American women. American women without the right to vote. To remove the political embarrassment of the daily pickets, Alice Paul and scores of other silent demonstrators were arrested, dragged to court, then thrown into prison, most at the notorious Occoquan Workhouse. There they were brutalized, forced to work, slept in rat-infested cells on bug-ridden mattresses, and fed food crawling with maggots. Even while incarcerated, they were pioneers in non-violent protest. They went on hunger strikes to protest their unconstitutional imprisonment and terrible treatment. But even this silent act would not be tolerated. She and fellow protestors had tubes jammed down their throats for forced feedings up to three times a day. All to prevent them from becoming martyrs for women’s suffrage. When news of the treatment of the suffragists reached the public, it became the turning point in the fight for the right to vote. Public opinion pivoted. President Wilson quietly agreed to endorse the federal amendment on January 9, 2018, six weeks after the release of the last incarcerated suffragists. That’s when the push for the 19th Amendment, guaranteeing a woman’s right to vote, became a possibility at last. That’s when the push for the 19th Amendment, guaranteeing a woman’s right to vote, became a possibility at last. The objective of the Turning Point Suffragist Memorial Association (TPSMA) is to educate, inspire and empower present and future generations to remain vigilant in the quest for liberty, freedom and equal rights. Education is the driving force behind everything to which the association aspires. How will we do it? By building a memorial to commemorate and honor those who fought for seven decades to enfranchise all American women, establishing the Turning Point Institute and developing a Constitution Trail in collaboration with numerous historical sites germane to our ever-evolving Constitution. The centennial anniversary of the passage of the 19th Amendment will be here in 2020, yet history’s relentless march forward swallowed many suffrage events and names. The women who fought for the right to vote are largely unknown today. And what happened to them at the Occoquan Workhouse is a story still waiting to be told. Nineteen education stations within the memorial will recount the 72-year history of the suffrage movement with a focus on those harshly imprisoned on the historic premises. This bloodless revolution made possible the largest expansion of democracy the world had ever seen with the enfranchisement of all 22 million American women with the stroke of a pen. It launched the genesis of women’s equal rights in the U.S. It provided a model for success used in subsequent battles for civil rights that followed in America and around the world. Fewer than eight percent of public outdoor venues across our country memorialize women. In a tour of the capital area, one will find monuments to many important historical figures instrumental in the fight for liberty, equality, and civil rights. George Washington, Thomas Jefferson, Abraham Lincoln, Mohandas Gandhi, Dr. Martin Luther King and veterans of wars fought for liberty. Yet unlike other heroes in the struggle for freedom, no national monument befitting the suffragists’ extraordinary contribution to our history has been established. No single place has been dedicated to remind us of their role or to inspire us to the same commitment to civic participation. This will all change with the opening of the Turning Point Suffragist Memorial. The memorial will restore a critical part of history about American women omitted from our history books. The memorial will commemorate the two million women from every state, creed, race and nationality who fought seventy-two years (1848-1920) to win ratification of the 19th Amendment to the Constitution – the right for all American women to vote. Without this right of citizenship, women would not have been able to advance in education, employment, wealth, civil rights, business ownership, or parental rights. The Turning Point Suffragist Memorial will be built in Occoquan Regional Park, Fairfax County, Virginia, part of the historic prison grounds where the infamous Occoquan Workhouse was located. Scores of Silent Sentinel suffragists aged 19 to 73 were unjustly imprisoned here where they were humiliated, kept in inhumane conditions, locked in solitary confinement and severely beaten. When word leaked out, it was the Turning Point in the battle for suffrage. Occoquan Regional Park is part of NOVA Parks (formerly known as Northern Regional Park Authority). An agreement between NOVA Parks and the association calls for NOVA Parks to provide the land as well as perpetual maintenance for the memorial pro bono. The association must privately raise the funds for the memorial. The Occoquan Regional Park is both historically important and strategically located for visitors. It is currently being redeveloped to become a cultural destination that will include the Jean R. Packard Occoquan Center expected to be open in early 2018. The facility will feature an exquisite, windowed, multipurpose building which will function primarily as an event center and also includes a café and educational exhibits. Educate, inspire, empower. Using the suffragists as role models, the Turning Point Institute (TPI) will pass on the skills and characteristics these women successfully employed by offering a range of ongoing programs. Interactive presentations, webinars, camps and mentoring will center on training youth in leadership, public speaking, political candidacy, social awareness and responsibility, civil rights, fiscal acumen, and equal rights as they apply to present and future generations. Our students will be diverse, from all socio-economic quarters and hail from all parts of the country as did the suffragists. Our programs are intended to serve as turning points in the lives of our scholars and empower them with the confidence they need to become leaders and advocates for social justice. George Mason University, Gunston Hall, Montpelier, the Workhouse Arts Center, The League of Women Voters, Delta Sigma Theta Sorority, the National Association of Women Business Owners (NAWBO), numerous businesses and other organizations have already expressed a keen interest in becoming intimately involved in the Turning Point Institute once the memorial is constructed. Remaining vigilant for equal rights has never been more important than today. After suffrage, Carrie Chapman Catt converted her state suffragist offices into the League of Women Voters that fights for voters’ rights every day. Alice Paul authored the Equal Rights Amendment which is still shy of ratification by three states; she fought for its ratification until her death in 1977. The late Supreme Court Justice Antonin Scalia opined that the equal protection clause of the 14th Amendment to the Constitution does not protect against discrimination on the basis of gender; women’s equality is still not part of the Constitution. Yes, TPI will be busy ensuring that today’s youth do not take their hard-won rights for granted and that there will always be more to do. The TPSMA has been working directly with Mt. Vernon, Gunston Hall and Montpelier, each of which has enthusiastically embraced the Constitution Trail concept. Fortunately the memorial site is in close proximity to these regional, historic properties that are relevant to our ever-evolving Constitution; Mount Vernon – home of George Washington, President of the Constitutional Convention and our first President under the Constitution; Gunston Hall – home of George Mason, Father of the Bill of Rights; Montpelier – home of James Madison, author of the Constitution, the National Archives that houses our Constitution; and several Civil War battlefields where the Constitutional concept of “united states” was tested. 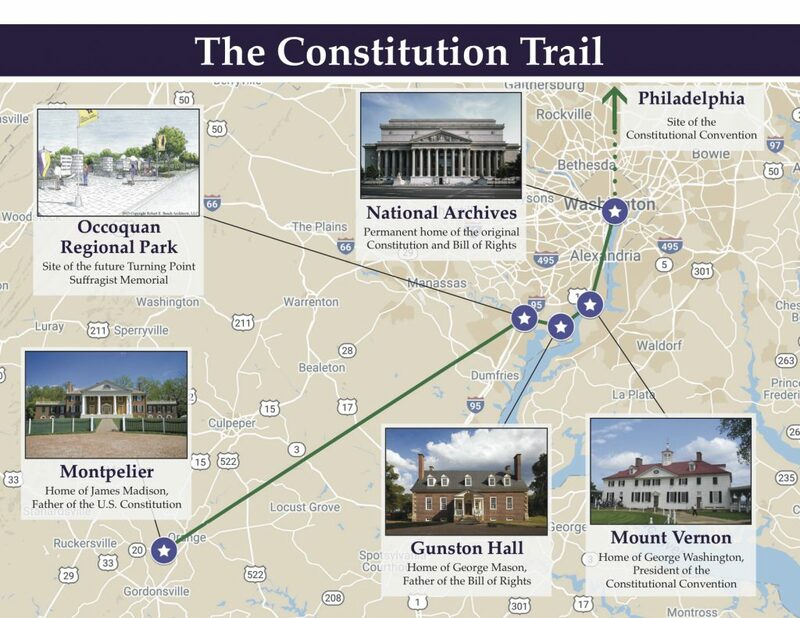 All will be part of the Constitution Trail and key destinations for travelers, school-age children, scholars, and those interested in the cause of democracy and equal rights. Based on current park attendance, we initially expect more than 375,000 visitors to annually visit the Turning Point Suffragist Memorial with many more who will learn of the memorial through participation in the Constitution Trail and Turning Point Institute. The conceptual design for the memorial was conceived by award- winning architect Robert Beach of Robert E. Beach Architects, LLC. Historians and curators from the Belmont-Paul Women’s Equality National Monument, the Smithsonian’s National Museum of American History, and other institutions have volunteered their time and expertise to ensure the design and content honor the memory of the suffragists and the history they fashioned. Entrance Plaza Gates will replicate those at the White House where suffragists stood as silent sentinels. The history of the suffrage movement will be told through 19 informational stations. A meditation area will provide visitors an opportunity to reflect on the memorial’s message of empowerment. The memorial is a significant element of the park’s redevelopment. A banquet facility, marina, amphitheater, restrooms, and new parking lots are within steps of the memorial. These features will ease access for large groups of visitors to attend special events with an historical focus, and to view presentations thematically linked to the memorial. An initial goal of $2 million must be raised by February 2019 to complete the memorial as depicted in the renderings. Supplementary donations will be used for such things as additional statuary. Donations can be accepted in cash or in-kind. The design concept is such that it can be value engineered to ensure that this sole, national suffragist memorial honoring all two million women who fought 72 years for enfranchisement will be operational by the centennial of the 19th Amendment, August 2020. Like most monuments, the Turning Point Suffragist Memorial must be funded entirely through private contributions. This project, like the dream of the suffragists, has been long in the making. Community leaders, historians, democracy activists, and others have worked closely for years to identify a site, design and content worthy of those the memorial will honor. Together with our partners at NOVA Parks we have begun our campaign to bring this monument to fruition. The year 2017 will mark the 100th anniversary of the incarceration of the suffragists and the turning point in the suffrage movement. This is the perfect time to raise our voices and celebrate that accomplishment, honor those whose sacrifices achieved it, and memorialize their actions for future generations. Once constructed, this national memorial will serve as a place for education, reflection and inspiration. It will both honor the women who are heroes of our past and inspire the citizens who will shape our future. With your help, the Turning Point Suffragist Memorial will come to life as both a destination and a new turning point in the recognition of the uniquely important role of women in democracy. The memorial will generate a new interest and promote scholarship in the significance of women’s roles in the cause of liberty.